Title – Homage to G Evelyn Hutchinson: Why are there so many kinds of animals? GE Hutchinson asked a question that had not been asked before: why are there so many kinds of species? In doing so, he brought together diverse fields of ecology that were hitherto investigated separately. He specially emphasized energetics and biogeochemistry in his view of the ecology of communities. This talk will put Hutchinson’s contributions into historical context and provide a sense of why he deserves to be remembered. In the acoustically communicating tree cricket species Oecanthus henryi, females prefer larger males but, in simultaneous playback experiments, they do not preferentially approach the lower frequency male calls that reliably indicate large body size. This might be because the females of this cricket species rarely hear multiple males simultaneously in the field. Males of several acoustically communicating species tend to form spatially and temporally structured choruses. We tested whether this scenario holds true for the males of Oecanthus henryi. We found that males showed site fidelity both across and within nights. We also studied the spatial patterning of males in the field using nearest neighbour distances. Using the male spacing data in conjunction with male call attenuation profiles and female phonotactic thresholds we were able to estimate the acoustic structure of male calling assemblages in the field. The broadcast areas of different males calling on a given night showed little overlap, suggesting that females will rarely hear two males simultaneously in the field. Next, we located females in the field and mapped the positions of calling males around them. We recorded the male calls and played them back from male calling positions and measured the sound pressure levels (SPL) at the female positions. These measurements indicated that females rarely hear more than one calling male at a time. Thus in Oecanthus henryi, simultaneous mate sampling by females rarely occurs in the field and any mate choice that occurs will have to be based largely on sequential sampling of males. In most insects that employ an ectoparasitic oviposition strategy (i.e. parasitise easily accessible hosts), sensory modalities such as vision, olfaction, and tarsal chemoreception may be adequate to locate their hosts. In such cases, the ovipositor plays a minor role in the recognition of the host. For non-pollinating fig wasps that oviposit from the exterior of the fig syconium and parasitise hidden hosts buried within the fig syconium, the ovipositor is the major sensory organ involved in host location. The structure of the ovipositor as well as the arrangement of sensilla is critical for the utilization of the right hidden host thereby leading to differences in sensitivity and specificity of the different wasps for host location. In this study, I investigate the role of the fig wasp ovipositor in differentiating between hosts with different oviposition histories both qualitatively and quantitatively. The African savanna is a heterogeneous and highly productive system that supports the highest diversity and density of terrestrial mammals in the world. Defined by a continuous grass layer interspersed with trees, the vegetation in this ecosystem is driven by complex interactions between biotic and abiotic factors. Of which, elephant and fire are among the most important agents of modification. I will discuss how an understanding of biocomplexity can emerge from long-term and large-scale studies of large trees in Kruger National Park, South Africa. From repeated surveys of individually-identified large trees (n = 2522, ≥ 5m in height) over a 6-year period, I will illustrate the multiple effects of elephant and fire. These effects were expectedly species- and landscape-specific, but the sequence of events was a key predictor of the sensitivity of trees to these agents and their probability of mortality. Without analyses of such spatial and temporal patterns of ecological drivers, we would fail to recognize a threshold of potential concern wherein the savanna irreversibly shifts into a grassland. Recent generic rearrangement of the circumtropical distributed skink genus ‘Mabuya’ has raised a lot of debate. According to this molecular phylogeny based rearrangement, the tropical Asian members of this genus have been assigned to Eutropis. However, in these studies the Asian members of ‘Mabuya’ were largely sampled from Southeast (SE) Asia with very few species from Indian subcontinent. To test the validity of this assignment and to determine the evolutionary origin of Indian members of this group we sequenced one nuclear and two mitochondrial genes from most of the species from the Indian subregion. The nuclear and mitochondrial trees generated from these sequences conﬁrmed the monophyly of the tropical Asian Eutropis. Furthermore, in the tree based on the combined mitochondrial and nuclear dataset an endemic Indian radiation was revealed that was nested within a larger Asian clade. Results of dispersal-vicariance analysis and molecular dating suggested an initial dispersal of Eutropis from SE Asia into India around 5.5–17 million years ago, giving rise to the extant members of the endemic Indian radiation. This initial dispersal was followed by two back dispersals from India into SE Asia. Voluminous wastewater is generated everyday mostly in urban areas in the country. The treatment of domestic wastewaters, presently undertaken inadequately in cities like Bangalore involves energy intensive bacterial processes that require regular tracking and optimisation, incurring higher operation and maintenance cost. These treatment systems are inefficient in capturing nutrients and cause prolific algal growth in surface waters. Indigenous algae commonly growing in wastewaters can be used for lipid production coupled with wastewater treatment. In this context a consortium of wastewater algae mainly comprising of Chlorococcum sp., Euglena sp., Phormidium sp. were studied and were examined for its abilities for growth, removal efficiencies of carbon (C), nitrogen (N) and phosphorus(P), and lipid accumulation, during their growth in municipal wastewaters. Results showed that the specific growth rate, maximum population density and maximum population growth rate of the algal consortia were 0.52 d-1, 8.27×106 cells.ml-1 and 0.91×106 cells.ml-1d-1 respectively. During the culture study, at the end of the exponential phase, removal efficiencies of ammonia N, total N, inorganic P, total P and total organic carbon (TOC) were 92%, 88%, 83.5%, 77% and 96% respectively. Algal biomass growth rate was 0.38 gl-1 and algal lipid content varied from 13-21% during the culture. Biochemical composition (carbohydrates, proteins, lipids and phosphates) variations and lipid accumulation studies, analysed by Attenuated total reflectance-fourier transform infrared (ATR-FTIR) and Raman spectroscopy showed higher lipid accumulation during the later stages of the culture. The composition analysis of fatty acid methyl ester (FAME) through GC-MS showed higher proportion of essential fatty acids with desirable biofuel properties that comprised of higher concentrations of saturates like palmitate (C16:0; ~30%) and stearate (C18:0; ~12%). The analysis shows the potential of indigenous wastewater algal consortia as a viable feedstock for biofuel production, that can be grown in the cities wastewaters (~1200 million litres per day) economically to yield >7,200 tonnes/yr of lipid to meet a substantial portion of the fuel requirement in the city. The spent algal-biomass after lipid extraction (~18,000 tonnes/yr) reused and can be anaerobically digested to yield ~7 Mm3 of bio-methane, thus fostering sustainable development. Title – Listening to bass notes: How to make size not matter? Low frequency sounds are advantageous for long-range acoustic signal transmission, but for small animals, they constitute a challenge for signal detection and localization. The efficient detection of sound in insects is enhanced by mechanical resonance either in the tracheal or tympanal system before subsequent neuronal amplification. Making small structures resonant at low sound frequencies poses challenges for insects and has not been adequately studied. Similarly, detecting the direction of long-wavelength sound using interaural signal amplitude and/or phase differences is difficult for small animals. Pseudophylline bushcrickets predominantly call at high, often ultrasonic frequencies, but a few paleotropical species use lower frequencies. We investigated the mechanical frequency tuning of the tympana of one such species, Onomarchus uninotatus, a large bushcricket that produces a narrow bandwidth call at an unusually low carrier frequency of 3.2 kHz. Onomarchus uninotatus, like most bushcrickets, has two large tympanal membranes on each fore-tibia. We found that both these membranes vibrate like hinged flaps anchored at the dorsal wall and do not show higher modes of vibration in the frequency range investigated (1.5-20 kHz). The anterior tympanal membrane acts as a low-pass filter, attenuating sounds at frequencies above 3.5 kHz, in contrast to the high-pass filter characteristic of other bushcricket tympana. Responses to higher frequencies are partitioned to the posterior tympanal membrane, which shows maximal sensitivity at several broad frequency ranges, peaking at 3.1, 7.4 and 14.4 kHz. This partitioning between the two tympanal membranes constitutes an unusual feature of peripheral auditory processing in insects. The complex tracheal shape of Onomarchus uninotatus also deviates from the known tube or horn shapes associated with simple band-pass or high-pass amplification of tracheal input to the tympana. Interestingly, while the anterior tympanal membrane shows directional sensitivity at conspecific call frequencies, the posterior tympanal membrane is not directional at conspecific frequencies and instead shows directionality at higher frequencies. 1.) What are the techniques to obtain class proportions from mixed pixels? 2.) What are the ways of identifying/extracting endmembers from the bands? 3.) How to address the mixed pixels when objects reflectance’s are non-linear mixtures in nature? 4.) How can we address the intra-class spectral variation or endmember variability? 5.) How can we predict class abundance’s spatial distribution at sub-pixel resolution within a particular pixel obtained from linear/non-linear mixture models? Finally, a novel technique — Hybrid Bayesian Classifier (HBC) is discussed, where the class prior probabilities for each pixel is determined by unmixing a supplement low spatial–high spectral resolution Multispectral (MS) data, and then Bayesian classification is applied to a high spatial–low spectral resolution MS data. This is demonstrated with two separate experiments. First, class abundances are estimated per pixel by unmixing MODIS data to be used as prior probabilities, while posterior probabilities are determined from the training data obtained from ground to classify IRS LISS-III MS data. Second, abundance obtained by unmixing Landsat ETM+ data are used as priors, and posterior probabilities are obtained from the ground to classify IKONOS MS images. Territory owners face the problem of how much effort to allocate towards defence-related behaviour versus maintenance activities. This problem can be quite complex in high-cost high-benefit territorial systems, such as lek-mating systems. If owners increase their allocation in territorial activities, they may lose condition more rapidly and lose their territories sooner to challengers. On the other hand, too little effort may also shorten territory tenure through more frequent challenges. Mating benefits on leks are high; hence, any reduction in territory tenure has large fitness consequences. Therefore, lekking males may be expected to modulate defence behaviour strategically in response to the nature of the threat posed by an intruder. On leks, males face threats from two kinds of intruders – neighbours and strangers. Neighbouring territorial males may pose a lower threat than strangers; accordingly, territorial owners may be expected to allocate less defence efforts following intrusions by neighbours rather than strangers. Little is known about such a dear enemy effect from high-conflict systems and, and about the threats posed by neighbours versus strangers. I present responses of territory owners to simulated intrusions by strangers versus those by neighbours. I evaluate the nature of the threats posed by these two categories of intruding males, and discuss the responses of territory owners in light of these threats. Finally, I explore the implications of such interactions towards territory-clustering and for the evolution of leks. Hemidactylus brookii is known to be a species complex for the past 150 years and is a recent topic of interest due to its complicated taxonomic history. Thought to be distributed pan-tropically, molecular phylogenetic work in 2006 revealed that its distribution was restricted to Asia. In this study, based on opportunistic sampling of H. cf. brookii, we try to tease apart cryptic species within the species complex using a mitochondrial and nuclear marker. We discuss some of the morphological traits associated with each clade retrieved using the molecular data. We conclude that the morphological characters of H. brookii collected from Borneo (type locality) by Bauer et al. 2010 do not match with that of the type specimen and hence the Hemidactylus sp. from Borneo is an undescribed species. We stress upon the importance of morphology based taxonomy especially when dealing with molecular data. Bent-toed geckos are the most diverse lizard group across South Asia. The Indian species have been placed in Cyrtodactylus (South Asian), Cyrtopodion (Palaearctic) and Geckoella (endemic to Peninsular India and Sri Lanka), with disagreement on the placement of many Himalayan species. The evolutionary history and higher-order relationships between these genera, and the placement of the Indian species remain unresolved as no published work has sampled across the geographic range of the group. A recent molecular phylogenetic study dealt with relationships within Cyrtodactylus, but had few Indian samples. Here we assemble a dataset using 2 nuclear markers (RAG1 + PDC, 1417 bp), including >20 additional taxa from across India including the Himalayas, and elucidate higher-order relationships between these genera. We recovered 3 broad, deeply divergent clades – Cyrtopodion plus allied Palearctic naked-toed genera, sister to Hemidactylus + Cyrtodactylus including Geckoella. The Cyrtopodion clade has three broad subclades – Stenodactylus + Tropiocolotes, Cyrtopodion + Agamura + Bunopus (Cyrtopodion s.s.), and Mediodactylus (including C. stolickzai (Steindachner 1867)). Cyrtodactylus also has three broad subclades, each distributed in different regions of Asia: a Himalayan radiation, an Indo-Burmese radiation, and a large subclade including all other Southeast Asian (SE Asian) Cyrtodactylus spp. + Geckoella. The SE Asian subclade has a number of well-supported groups, including species from the Papuan region, Sundaic subregion, and a mix of Central and Eastern Indochinese species within which the monophyletic Geckoella is nested. The position of the Palearctic species, Tropiocolotes persicus euphorbiacola Minton, Anderson & Anderson 1970 is unique, falling outside this entire radiation. Biogeographic reconstructions show the ancestral area of the bent-toed geckoes to have been in Laurasia. While extant Cyrtopodion diversity is in the Palearctic, ranging from south Europe to northern, western and central India, Hemidactylus is cosmopolitan in distribution, and Cyrtodactylus is found across parts of South Asia and Southeast Asia. Cyrtodactylus probably originated in the circum-Himalayan region and has followed a broadly west to east pattern of diversification. Geckoella appears to have come into Sri Lanka ~ 35 mya and into India about 30 mya, apparently by dispersal from Indochina as Geckoella is deeply nested within Indochinese Cyrtodactylus. These dates correspond to about the time the Indian plate was colliding with the Eurasian plate, with two possible hypotheses of dispersal. The first hypothesis, invoked for freshwater crabs, considers that Southeast Asia and the Indian plate were in close proximity in the middle to late Eocene with possible temporary land bridges connecting the landmasses. The alternative is that Geckoella came into Sri Lanka via a trans-oceanic dispersal event, as geckos are known to have crossed marine barriers at various points in their evolutionary history. Sampling of Cyrtodactylus from Sri Lanka and the Andaman and Nicobar Islands is vital in determining the evolutionary origin of Geckoella. Variation in secondary sexual traits make up the raw material for sexual selection. We quantified variation in a multi-component calling song of the field crickets, Plebeiogryllus guttiventris, in a wild population. We used repeatability analysis to study variations in the spectral and temporal characteristics of the acoustic signal, across two temporal scales- within and across nights. We recorded calling songs and SPLs from the same individuals multiply with variable time intervals. Carrier frequency (CF) was found to be the most repeatable character followed by SPL, while chirp period (CP) was least repeatable. Within-night repeatabilities of almost all the acoustic features were higher than their corresponding across-night values, indicating high consistency of acoustic features within a female’s sampling session. Differences in across-night repeatability of acoustic features implied differential effect of immediate environment such as nutrition. Hence, using a simultaneous choice paradigm, we investigated the female preference pattern for the most repeatable acoustic feature (CF) and the least one (CP), separately. Females showed no consistent pattern of preference for CF but were significantly attracted towards the lower CPs. However, the attractiveness towards lower CP calls disappeared when traded off with SPL. Our results show that females use a less repeatable acoustic feature for mate discrimination instead of a highly repeatable one. SPL which is known to play an important role in female phonotaxis in this species, successfully overrides any female preference for CP. Thus SPL seems to be the most crucial acoustic feature determining a male’s attractiveness. Physical aggression and serious injuries in male-male combats among elephants is rare and we sought an explanation under evolutionary game theory. In the “War of Attrition” (WOA) contest model individuals compete with non-dangerous displays and the one who persists longer is the winner. Musth in male elephants is a temporary cyclic sexual state lasting for a few days to several months. Musth state is characterized by elevated plasma testosterone level and signaled to con-specifics via temporal gland secretion, urine dribbling and pheromones. Musth is positively correlated with dominance and reproductive success. Therefore we considered the state of being in musth itself as the display in male-male combats for mates. Musth duration varies with age and we hypothesized that the age-specific display durations of musth is optimized to minimize the probability of costly escalated contests. We mathematically computed optimum display durations from adult male age-structure and tested the predicted values with published data on age-specific musth duration of African elephant populations of Amboslei and Samburu, Kenya. The predicted and observed age-specific musth durations matched remarkably well. To test if this age-related strategy is evolutionarily stable we treated the entire adult life span of a male elephant as one single WOA contest with age-specific musth duration as the “bids”. The frequency distribution of bids was indeed a negative exponential as predicted by the model. For the Amboseli population the WAO model predicts that 75% (95% CI: 67-83%) of a male’s life time reproductive success is gained when in musth and 25% otherwise. Genetic paternity success data for Amboseli accord 74% of paternity to males in the state of musth. The predicted paternity success of Samburu musth males is 69% (95% CI: 62-81%) and that reported is 75-80%. WOA is therefore a reasonable approximation of male-male contest in elephants and the rarity of physical aggression is therefore no surprise. Even the testosterone charged musth elephants are just displaying which in game theory is termed the “mouse” strategy. Contradicting Darwin who said that “No animal is so dangerous as an elephant in musth” the elephant is mostly a mouse. Title – Where did the endemic limbless Indian skinks come from? Scincinae is one of the four subfamilies of the family Scincidae. Based on earlier morphological studies, it is known to be the most primitive among other subfamilies of skinks. Scincinae is much diverse in Africa, Madagascar and Seychelles while in Asia (central and east) the scincine diversity is depauperate. The genera in the Indian subcontinent are Barkudia, Chalcidoseps, Eurylepis, Ophiomorus, Nessia and Sepsophis. Of these, the limbless Barkudia and Sepsophis are endemics to the Indian subcontinent. Limb reduction is seen commonly in the subfamily, although only about 28 of ~180 species completely lack any external trace of limbs while there is a gradation of limb reduction seen across the rest of the species. Earlier molecular studies have largely focused on evolutionary origins of the Afro-Malagasy and Seychelloid Scincines. Considering the unique biogeographic history of the Indian subcontinent and the current extant distribution of Scincines, it would be interesting to know the evolutionary origin of these limbless skinks from peninsular India. By generating molecular data and combining it with the published sequences of other Scincines, we are building a phylogeny to understand how and when these limbless Indian skinks originated. Some of the preliminary results of this fascinating question shall be presented. However, the results are currently inconclusive as the position of the endemics is varies across different tree building methods. Upon nutrient starvation, cellular slime mould (CSM) amoebae aggregate at common collection points by chemotaxis and form social groups with division of labour. Eventually some cells differentiate and form the dead stalk whereas others survive and form live spores. This constitutes an extreme example of apparently altruistic and selfish behaviour within a social group. In our attempt to understand the evolutionary origin and maintenance of ‘altruistic’ behaviour, we have made several observations on the CSMS isolated from a 50-hectare plot of undisturbed forest soil in the Mudumalai reserve in South India. The data will be presented to demonstrate (a) individuals belonging to different strains of a species, different species and genera occur in close proximity and can form clonal, intra-species polyclonal and interspecies social groups; (b) strains differ in their propensity to discriminate self from non-self; (c) in chimaeric social groups one strain usually ‘exploits’ the other during sporulation; and (d) despite such exploitations strains coexist in the wild. The implications of these findings will be discussed in the light of evolutionary models for altruistic behaviour in the CSMs. Genus Glyphochloa is endemic to India and restricted to high or low altitude lateritic plateaus of the peninsula. Ophiorus is another genus with about 14 genera occurring from Africa to Asia. However one species, Ophiuros bombaiensis is closely allied to Glyphochloa on the basis of morphology, cytology and biogeography. In order to deduce the relationship between Ophiorus bombaiensis and Glyphochloa we studied their phylogeny using the chloroplast trnTL-trnLF and the nuclear ITS regions. Results indicate that Glyphochloa species form two separate clades one having species adapted to high altitude lateritic plateaus and the other in low elevation coastal region. The two clades also corroborate well with the basic chromosome numbers of n=7 and n=6. Ophiuros bombaiensis is nested in the low altitude Glyphochloa clade and therefore warrants for its inclusion in Glyphochloa. In the early 1970s, a young undergraduate student at the Indian Institute of Technology in Madras discovered that his love of the beach far outweighed his passion for engineering. Spending most of his mornings swimming on one of the nearby beaches did not help Satish Bhaskar graduate from IIT, but it did bring him into contact with Romulus Whitaker and others who had initiated a sea turtle conservation project on the Madras coast. Bhaskar visited the Gulf of Mannar in 1977, and started a career of turtle walking that lasted close to 20 years. In that time, he surveyed almost the entire mainland coast of India, most of the islands in the Andaman and Nicobar, many of the islands of the Lakshadweep, and threw in a couple of visits to West Papua for good measure. The very first surveys for most sites, indeed the first visit by an ‘outsider’ to many remote locations, his work provided baselines that are still being used. Bhaskar’s surveys included some extraordinary expeditions, including when he marooned himself on Suheli Island in the Lakshadweep during an entire monsoon. He also spent several weeks each year monitoring hawksbill turtles on uninhabited South Reef Island in the Andamans. Bhaskar inspired a generation of researchers with his passion for exploration, combining curiosity about biology and pragmatism about conservation. This talk will track the turtleman whose own migrations rivalled those of the marine reptiles whose secrets he sought to uncover. Eavesdropping by bat predators on prey-generated sounds, including intra-specific acoustic communication signals of prey species, has been postulated to be an important selective force on the evolution of these signals. In a paleotropical evergreen forest habitat, we established, by diet analyses, that Megaderma spasma, the lesser Indian false vampire bat, is a major predator of several katydid species, including those belonging to the subfamilies Pseudophyllinae, Phaneropterinae and Mecopodinae. We used both indoor and outdoor acoustic playback experiments to examine whether M. spasma eavesdrops on the calls of some of the most abundant and acoustically conspicuous katydid species in this evergreen forest assemblage. Our results demonstrate that M. spasma does indeed use these calls to approach potential prey. Experiments with tethered, flying katydids revealed, however, that insect flight was far more effective in eliciting approaches from the bats than playback of the katydid calls. The implications of these results for the evolution of katydid acoustic signals are discussed. Relic forests are part of the semi-natural landscape where human interventions influence land use patterns and processes. These forest patches, often with socio-cultural relevance act as tradeoff between livelihood demand and ecosystem integrity within the landscape. We have been involved in studying relic forest patches in Uttara Kannada district of Karnataka to highlight their role in local ecosystem dynamics and biodiversity maintenance. An overview of the studies conducted in the area would be presented with an emphasis on local hydrology, endemism as well as temporal changes taking place over the system. Urbanization entailing large scale land use changes ismore often associated with huge depletion of natural resources affecting the ecology and environment. Monitoring land cover dynamics has become a necessity for the sustainable management of natural resources. Temporal analyses of land cover and land use provides a historical perspective of the area under investigation and gives an opportunity to assess the spatial patterns, trends, and impacts of the change that helps in better planning of the region. Main objective of thework is to quantify the urban dynamics using temporal remote sensing data with the help of spatial metrics. Bangalore with the rapidly urbanizing landscape has been chosen for the investigation. Temporal remote satellite data of the period 1973 to 2010 have been processed along with the time-series analysis of spatial metricsto understand the landscape dynamics.Land use analyses show that there has been a 584% growth in built-up area during the last four decades with the decline of vegetation by 66% and water bodies by 74%. Analyses of the temporal data reveals an increase in urban built up area of 342.83% (during 1973 to 1992), 129.56% (during 1992 to 1999), 106.7% (1999 to 2002), 114.51% (2002 to 2006) and 126.19% from 2006 to 2010. The Study area was divided zone wise into four zones based on directions and each zone is further divided into 17 concentric circles of 1km incrementing radius. The urban density gradient illustrates radial pattern of urbanization for the period 1973 to 2010. Bangalore grew radially from 1973 to 2010 indicating that the urbanization is intensifying from the central core and has reached the periphery of the Greater Bangalore. Shannon’s entropy was computed to understand the level of urbanization at local levels. Shannon’s entropy values of recent time confirms of dispersed haphazard urban growth in the city, particularly in the peripheral parts/outskirts of the city. Landscape metrics aided in understanding the urbanization and sprawl dynamics. The major conversion of small patches to large single patch can be seen post 2006. In the year 2010 patches are maximally aggregated indicating that the city is becoming more compact and more urbanisedin recent years. These resultswith spatially explicit information provide insights for effective decision making at local levels. The phylogenetics position of Capped and Golden langurs has been much debated in recent times. Currently they are placed in Trachypithecus, a genus distributed predominantly in Southeast Asia. However recent molecular studies have generated conflicting results. For example, in the mitochondrial Cytochrome b tree they branch with Indian langurs, genus Semnopethicus. However in another study the same gene supported their relationship with Trachypethicus. A few nuclear markers also suggest this relationship. Two possible reasons have been proposed to explain this discordance including, past Hybridization between Semnopethicus and Trachypethicus and incomplete lineage sorting of the ancestral haplotypes. Another study proposed a climatic model to explain current distribution of species based on paleoclimatic changes and morphological convergence. To resolve the phylogenetic and taxonomic position of the capped and golden langurs I will be sequencing multiple nuclear makers from wild collected samples of capped and golden langurs. These sequences along with published sequences of Semnopethicus and Trachypethicus will be used to generate a robust nuclear phylogeny of these langurs. The resulting phylogeny can then be used to understand their evolutionary origin and also to access their conservation status in a phylogenetic framework. The symposium spanned over two days and 7 sessions. Each talk was 20 minutes long followed by a 5 minute discussion. 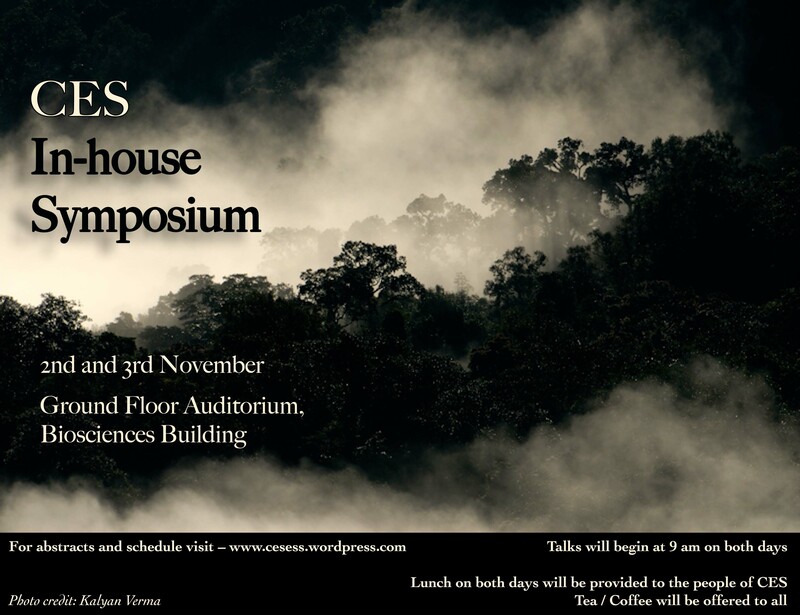 You can download the schedule from here – CES In-house Symposium Schedule (PDF).